The excellent power-to-weight ratio and good back up torque give a unique combination of the power of heavier tractors and the fuel efficiency of light models. TAFE tractors are equipped with direct injection engines, built to meet the stringent emissions standard using the latest technology. These long stroke engines are reliable, powerful and economical and designed to deliver class leading power and torque required for a variety of uses. TAFE Tractors feature sliding gear transmission with eight forward and two reverse speeds. The transmission is geared for power, economy and smooth transition, and is designed to withstand tough working conditions. The live PTO with dual clutch lets you control tractor motion independently of PTO driven implements. Slight depression of the clutch stops the tractor's forward motion, while full depression stops the PTO action. This protects the gearbox and PTO from undue stress, gives improved results at mowing, topping etc., and is safer as it ensures that the tractor stops moving when the clutch disengages. Independent handbrake and either drum or oil immersed brakes. The pedals are ergonomically designed to minimise leg effort and allow either simultaneous or independent left or right braking. The hydrostatic power steering is simple and reliable and allows the driver to exert minimum effort while maneuvering tight corners, particularly when the front wheels are under heavy load i.e. with a loader. The design and location ensures ease of servicing. TAFE tractors are equipped with a proven draft and position control hydraulic system for accurate and reliable performance enabling the height or depth of rear mounted equipment to be set with no need for constant operator adjustment. This ensures better results when using soil-engaging equipment, Fertiliser spinners, Yard scrapers, Mowers, Toppers, Tedders etc. 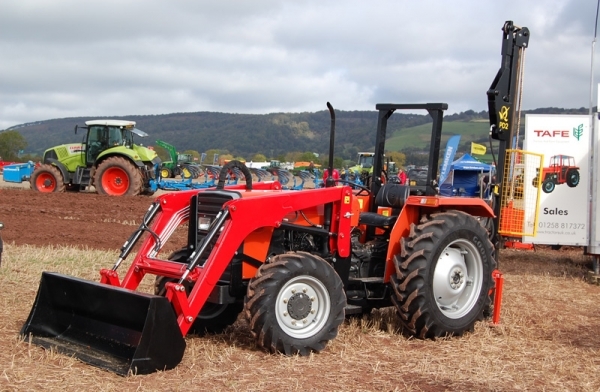 All TAFE tractors have category 1 and 2 linkage and trailer tipping equipment. The tractors cost (virtually) nothing to buy or run for the hours that they do. For around £11,000 you can have a new and very much proven tractor with oil-immersed brakes and a warranty for two years or 1,000 hours.